I’m not sure about the rest of you, but I’m starting to feel the tug of a stretched out immune system and fall weather! I hope these are some things you can add to your sub tub!! For your younger students who desperately want to write music, this is a fun practice activity. They draw a card and then use that to play tic tac toe instead of the x’s and o’s. Works well for a sub because they simply have to supervise the class and do not need to know anything about music! Buy them here. These would be great and I plan on leaving them for grades 2 & 3 as a partial set, and grades 4 & 5 as a whole. I have these rhythmic composition cards. I just created them to use in my montessori class, but I think they would be great for you, or as a sub activity after the class has been shown them. They have 6 measure options, and several options for notes and rests. All the note and rest cards are sized appropriately with the value of the beat. The can use them to play rhythms they write, as a composition rhythms to play, to write, etc. I will be adding some of the Kodàly notation soon!!! Get them here. Then there is this freebie I found on Pinterest. 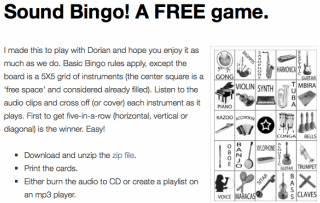 It is a music bingo game with instruments, but instead of calling the instruments, the creator has put together sound files to call. It would be great for a sub, but also nice for you to use as well! I hope these are a few good ideas. What I love about them is that they are all items you can leave for non-music subs. When I need a sub, I usually get a non-music person. Not only do I end up losing instruction, but it ends up being frustrating for them and the kids because there is not much with my curriculum they can do. These are going to be great resources for me or a sub to use. We are getting best online sub tub ideas for the music room. They are given the stories to find new topics and reviews. Then after every user happy to follow the blog updates and reviews.